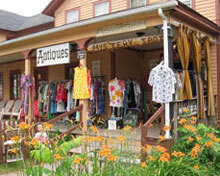 Mystery Spot Antiques is located right on Main Street in Phoenicia, NY, deep in the heart of the Catskill Mountains. Our official address is 72 Main Street….though if you actually want to mail us something, you’re best off trying us at P.O. Box 488, Phoenicia, NY 12464.Our phone number is (845) 688-7868, or, as we like to say here in Phoenicia, NUTS-TO-U! We can also be reached at info@mysteryspotantiques.com. It’ll soon be our EIGHTEENTH SEASON in Phoenicia! We’re currently hibernating for the winter, but plan to re-open sometime in April. Follow us on Instagram (@mysteryspotantiques) or sign up for our mailing list to be in the loop!. Please always contact us first before traveling a distance, just to make sure we’re open. Sign up for our mailing list (on sidebar) and/or like our Facebook page to stay in the loop about our hours, sales, and special events. Contact us anytime via phone (845-688-7868) or email (info@mysteryspotantiques.com) if you have old records, vintage t-shirts (concert tees, etc. ), vintage clothing or estate items you wish to sell or trade. We’re a mere 2 hours and change from New York City. (And only 20 minutes from Woodstock). Just take the NYS Thruway to Exit 19 (Kingston). Then take Route 28 West for 23 miles. You’ll see a festive sign for Phoenicia (it’s the village after Mt. Tremper) depicting a trout, a tuber and a fisherman. Turn right, go over the RR tracks, take a left at the stop sign (Main Street). You’ll find us right next to the Sportsman’s Alamo’s (great food!) giant statue of Davy Crockett on the left. Park anywhere on Main Street, or pull into the driveway behind Brio’s for more parking. Click here for Mapquest directions. 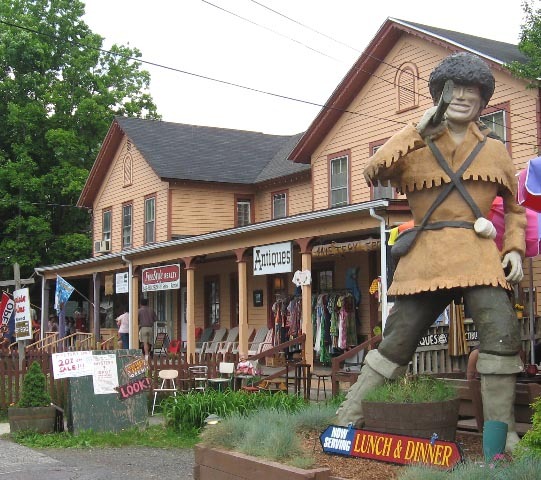 Phoenicia is known for its hiking, fishing, glorious wilderness, tubing down the Esopus, and the Lost Treasure of Dutch Schultz. Pancakes at Sweet Sue’s are a must. Please check out our links for suggestions of some wonderful places to see and things to do when visiting. Bring the dog and make a weekend of it! 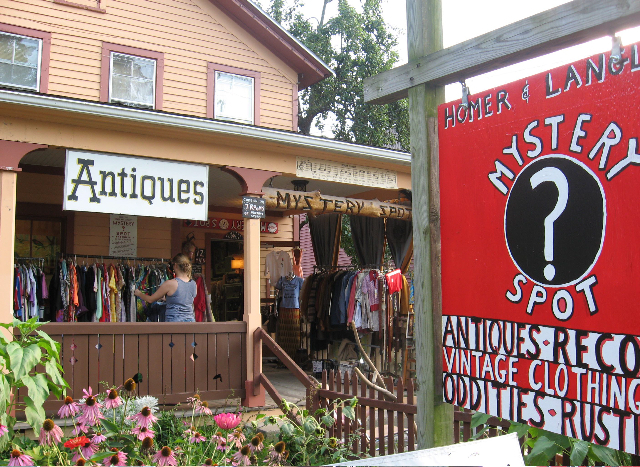 Don’t just take our word for it — read what some of our customers had to say about Homer & Langley’s Mystery Spot Antiques on two of our favorite travel review sites: Yelp and Trip Advisor. 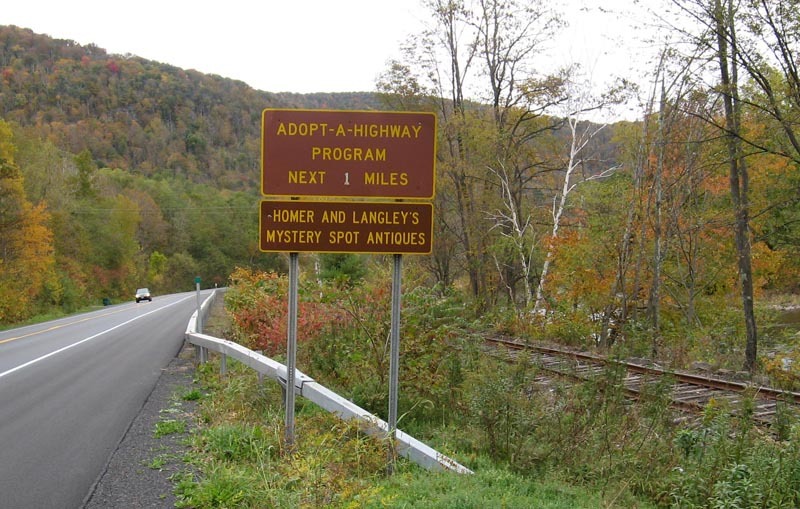 Homer & Langley’s Mystery Spot has proudly adopted a scenic stretch of Route 28 running alongside the Esopus Creek and the railroad tracks, heading into the village of Phoenicia (between the Catskill Mountain Railroad and the Phoenicia Diner). If you see our Adopt-A-Highway sign, you’re almost at the turn-off for Main Street!